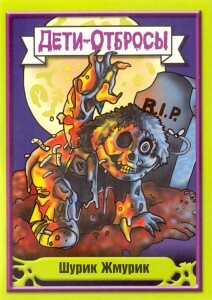 At some point prior to 2009 Topps Europe Ltd. (Merlin) published a set of Russian Garbage Pail Kids in Russia. 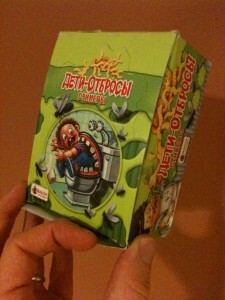 The Russian Garbage Pail kids are phonetically pronounced ‘Deti Otbrosy’ in English. The collation of the set exactly matched the previous 2004 UK All New Series Garbage Pail Kids Sticker Album set. The Russian set consists of 181 base cards (1-181) and 11 bonus cards (G1-G11). It is not clear exactly when the stickers were released in Russia. The first time the cards were seen in the U.S. was in late 2009. Wayne from WGPKR and -TCT (world renowned foreign GPK collector) from GPKUG found the stickers on a Russian website. Wayne and -TCT imported enough Deti Otbrosy to put together approximately 16 sets. The sets were sold to other GPK collectors. 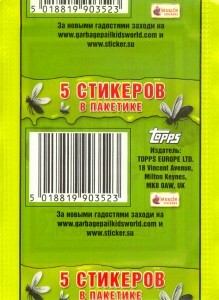 Each pack of Deti Otbrosy contained 5 stickers. The packs are very similar to other Garbage Pail Kids European sticker set releases. 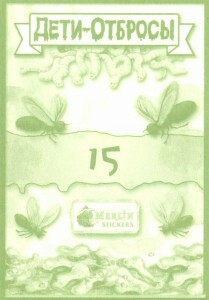 Each pack contained four regular stickers (green border) and one foil sticker. The album that accompanied the Deti Otbrosy is seen below. Again, the album closely matches other GPK sticker albums released in Europe since 2004. The album has a cardboard front and back cover with paper pages inside. The pages have spaces to put every sticker in the set. Of the 192 total stickers in the set, 32 of them were foil stickers. The foil stickers seem to have been picked at random. The Deti Otbrosy box is seen below. The box contained 50 packs. A full box yields 250 stickers (200 green border stickers and 50 foil stickers). Thank goodness for the “Dissolution of the Soviet Union” or these would have never seen the light of day. Tell me about it! I can’t wait for the North Korean GPK to surface…. Good find on these, keep up the searches! 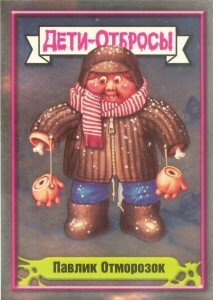 Here is a picture of the Russian GPK cards on sale in Russia (Thanks -TCT). I have heard from a contact in Russia that these items are not technically allowed to be sold in Russia so they are not very well known or popular. I have a complete Russian set for sale. Check out the Dutch Garbage Pail Kids forum.